Refrigerated dough—crescent rolls, pizza crust, biscuits, pie crust, cookie dough, cinnamon rolls—is already a baking hack, as it allows you to make classic recipes quickly and easily. 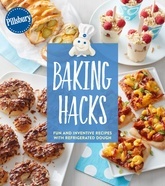 Now, the experts from the Pillsbury Kitchens have created more than 125 delicious recipes that show you how to "hack the hack." Sheet Pan Grilled Cheese from pizza dough and Brown Butter Peach Crumble Bars from refrigerated sugar cookies are just two examples of how to transform dough basics into fresh, even more creative creations for appetizers, sweet and savory breads, mains and desserts. Special features call out specific product hacks, and icons throughout note 30-minute recipes and recipes made with three ingredients or less.